Hillary Clinton will be the first woman nominated by a major political party to run for president of the United States, but she is certainly not the first woman to seek the office. This month historian Kimberly Hamlin profiles women who have tried to win the Presidency—an office that thus far has been a club for men only. On June 7, 2016, Hillary Rodham Clinton (below) secured enough delegates to become the Democratic nominee for president of the United States. As everyone knows, this will make Clinton the first woman to attain the Democratic or Republican nomination for president. But she is far from the first woman to run. Since 1872, fourteen women have run for president, three of whom garnered support at a major party national convention. Five were nominated as third-party candidates, and two were eventually chosen as major-party candidates for vice president. In addition to the fourteen women who have run for president, several others have come within striking distance of the nation’s top post through the line of succession. Representative Nancy Pelosi was second in line for the presidency from 2007-2011 (after the vice president) when she served as the first, and to date the only, female speaker of the U.S. House of Representatives. Secretaries of State Madeleine Albright (1997-2001), Condoleezza Rice (2005-2009), and Hillary Clinton (2009-2013) were fourth in line during their tenures. Still, no woman has been elected to serve in the executive branch of the federal government. Ninety-six years after women attained the right to vote, 24 presidential elections and 14 female presidential candidates later, this uneven and long history raises a basic question: Why has it taken so long for the United States to join with the 63 nations of the world that have been led by a woman at some point between 1963 and 2014? And, if history is a guide, might 2016 be the year that the United States finally elects its first female president? By looking at several of these women and their campaigns for the presidency we can see a few key patterns as well as the changing (and not so changing) lenses through which Americans view women. Of the fourteen women who have run for president, some ran as feminist reform candidates, a few entered public life via their husbands’ political careers (though husbands have proven a vexed issue for most female presidential candidates), and some gained traction as “law and order” candidates. 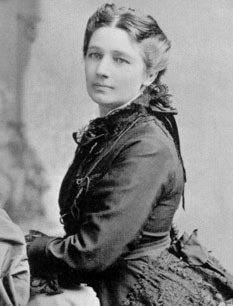 The first woman to run for president, Victoria Clafin Woodhull, ran as a feminist reform candidate—revolutionary might be more accurate—in 1872. Victoria Clafin Woodhull ran as a feminist reform candidate in 1872 (left). Harper’s Weekly cartoon depicting Woodhull in 1872 with caption reading “Get thee Behind Me, (Mrs.) Satan!” (right). Woodhull was born in 1838 in the tiny village of Homer, Ohio. As the seventh of ten children born to very poor parents, young Victoria complemented the family’s meager income with her skills as a clairvoyant and fortune teller. At the age of 15, she was married to Canning Woodhull, an alcoholic nearly twice her age. By 16, she had given birth to a severely disabled son. After having a second child with Woodhull, she left him and, in 1866, married Colonel James Harvey Blood and moved to New York City to begin anew. With the patronage of the eccentric millionaire Cornelius Vanderbilt, Woodhull and her sister Tennessee Claflin set up a brokerage office on Wall Street. Among the nation’s first female stock brokers, they quickly grew wealthy. In 1870, they began publishing a women’s rights newspaper called Woodhull and Claflin’s Weekly. Woodhull announced her candidacy for the presidency in her newspaper in April 1870, a full two years before the next election, and skillfully used the paper as the press organ for her campaign. Several months after announcing her candidacy, she was nominated by the Equal Rights Party as their candidate despite the fact that, at the age of 34, she would have been too young to actually serve as president. For a variety of reasons including but not limited to her age, Woodhull stood little chance of appearing on ballots or garnering votes but, as a protest candidate, that was largely beside the point. Woodhull’s goal was to draw attention to women’s second-class status in America in general and, in particular, to protest the recently ratified 14th and 15th Amendments, which enfranchised African American men but not women (of any race or ethnicity). Ultimately, however, Woodhull was plagued by scandals, some of her own making and others that she publicized in her paper. In 1872, her mother took Woodhull’s second husband to court on a variety of salacious charges. The resulting court documents revealed that Woodhull lived in a house with both her first and second husbands, and a new friend named Stephen Pearl Andrews. Amidst these accusations of sexual impropriety and “free love,” newspapers across the country had a bonanza. In response, she used her newspaper to expose the adulterous affair conducted by “the most famous man in America,” Henry Ward Beecher, brother of Harriet Beecher Stowe. But because of the recently passed Comstock laws that prohibited the printing or mailing of anything “obscene,” Woodhull was arrested simply for writing about Beecher’s affair in her newspaper. She spent the election night of 1872 in jail. After Woodhull’s pioneering run, Belva Lockwood, the first woman lawyer to practice before the Supreme Court, ran for president on the Equal Rights Party ticket in 1884 and again 1888. In 1916, Jeannette Rankin of Montana became the first woman elected to Congress, and in 1933, Frances Perkins became the first female cabinet secretary when President Franklin Roosevelt appointed her to lead the Department of Labor. By mid-century, women had earned a small but secure place in the federal government, though their posts were largely limited to those pertaining to women’s, family, or children’s issues. For the first half of the 20th century no woman ran for the nation’s highest office. Then came Margaret Chase Smith of Maine (right), who sought the Republican nomination in 1964. Smith was first elected to Maine’s one seat in the House of Representatives in 1940 to fill the unexpired term of her late husband, Clyde Smith. She had worked in Clyde’s D.C. office and harbored political aspirations of her own. Clyde endorsed her from his death bed and encouraged his supporters to vote for her in the upcoming Republican primary. Smith ably filled her husband’s term and was re-elected to the House three more times before running for the Senate in 1948 with the slogan “Don’t Trade a Record for a Promise.” Her 1948 Senate victory made her the first woman elected to both houses of Congress. From her very first few months in office, Smith earned a reputation as an iconoclast and a strong supporter of the military. In 1941, with World War II at the top of the nation’s agenda, Smith broke ranks with her Republican colleagues to support the first-ever peacetime draft, the Lend-Lease Act, and the arming of American merchant ships. She later asked to be placed on the House Naval Affairs Committee and persuaded her colleagues that members of the Women Accepted for Voluntary Emergency Services (WAVES) should be allowed to volunteer to serve on noncombat international missions. Known for always wearing a red rose on her lapel, Smith became famous for her 1950 speech, “Declaration of Conscience.” As a first-term senator in 1950, she had become increasingly concerned about the anti-communist rhetoric and tactics of her colleague, Senator Joseph McCarthy of Wisconsin. In January 1964, Smith announced her intention to run as a Republican candidate for president in the New Hampshire and Illinois primaries. Following her previous congressional electoral strategies, Smith declined to solicit campaign contributions, refused to campaign when the Senate was in session (lest she miss a vote), relied only on her personal money and on unpaid volunteer labor, and refused to purchase advertisements. Instead, Smith declared that she would once again run solely on her record. In accordance with her busy Senate schedule, Smith campaigned in New Hampshire for just two weeks and secured only a few thousand votes. In Illinois, however, she won nearly 30% of the votes and came in second to Barry Goldwater, the eventual nominee. That summer at the Republican convention, she received 27 first-ballot votes. Defying convention custom, Smith chose to remain in the auditorium while her name was read in front of all the delegates, savoring her place in history. As the “first female Cold Warrior,” Smith continued to take a hardline stance on military issues and she was an early and enthusiastic supporter of U.S. involvement in Vietnam. In 1972, Smith was defeated in her bid for Senate re-election by Democrat William Hathaway who criticized her support for the Vietnam War and repeatedly drew attention to her age. While Smith lost her bid for re-election in Maine, in other ways 1972 was a watershed year for women running for president. One hundred years after Woodhull’s run, two women ran for president–Hawaii Representative Patsy Mink (below, left) and New York Representative Shirley Chisholm (below, right)—and two women received convention votes for the vice presidency, Frances “Sissy” Farenthold and Tonie Nathan. After decades of feminist activism, the Equal Rights Amendment passed both houses of Congress in 1972 and, the following year, Roe v. Wade affirmed a woman’s constitutional right to bodily autonomy. In this context, then, it seemed only natural that women might pursue the nation’s highest office. Chisholm’s campaign was the most successful of these female presidential and vice presidential candidates of 1972. Before entering national politics, Chisholm had served in the New York State Legislature and worked as a teacher and director of child care centers. In 1968, Chisholm became the first African American woman elected to Congress (and she hired an almost all-female staff). Chisholm campaigned against the Vietnam War and for the rights of women, people of color, and poor people. As a representative, she introduced legislation to increase federal funding for daycare, voted against military spending, and led the charge for federal funding of school lunch programs, among many other issues. In a field crowded with twelve other candidates, Chisholm emerged as a powerful voice. Wherever she traveled, large crowds gathered to hear her speak and shake her hand. Like Smith, Chisholm ran largely without the support of party insiders or financiers. A chic dresser in tailored outfits and perfectly coiffed wigs, Chisholm entered the race simultaneously as an outsider and an insider. In an era of widespread distrust of government and mass protest, she wanted to revolutionize a broken system from within. Indeed Chisholm’s very candidacy was largely made possible by changes to the Democratic Party’s nomination process (from closed door meetings of insiders to public primaries) recommended by the McGovern-Fraser Commission following the disastrous 1968 Democratic convention. (The presidential nomination process has changed dramatically over the years and variations exist within parties.) Chisholm also went to federal court to challenge the policy granting televised debate time only to front-runners and won the right to appear on TV. Chisholm hoped to use her historic candidacy to draw new people to presidential politics—inner city residents, women, people of color, and young people recently enfranchised by the 26th Amendment which lowered the voting age to 18. At the 1972 convention, Chisholm carried 151 delegates and earned the right to speak from the main podium. Feminists were not the only women to be inspired by the changing gender politics of the 1970s to run for president. In fact, the first woman presidential candidate to qualify for federal matching funds and secret service protection was Ellen McCormack (right) who ran as an anti-abortion candidate in both 1976 and 1980. As a Democratic candidate in 1976, McCormack secured 22 convention delegates; however, she used her federal matching funds to air what were essentially anti-abortion ads which prompted Congress to revise the rules regarding matching funds. In 1980, she ran as the Right to Life Party’s nominee and garnered more than 32,000 votes in the three states in which she appeared on the primary ballot. In the 1980s, two third-party female candidates for president also qualified for federal matching funds: Sonia Johnson who ran on the Citizens Party ticket in 1984 and Lenora Fulani who ran on the New Alliance Party ticket in both 1988 and 1992.